ScreenCheck is happy to announce the new release of our desktop ID badge software, BadgeMaker 2.6. 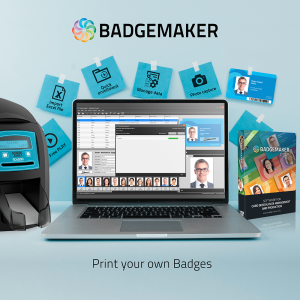 Next to a couple of great new features and improvements of the software, we also gave the BadgeMaker website and the License Manager a small facelift. English, Spanish, German, French, Polish and Dutch. and quick updates can now be done via a button in the layouts panel. Quick-print settings are now saved and retrieved from the user default print settings. This prevents confusion, and also ensures that no problems arise after a printer driver update. The Magicard Ultima is now supported (although still with a few known SDK issues). will be asked after a crash whether (once) a report may be sent. BadgeMaker Design now offers fixed-length settings for dynamic fields. the edges of the element (by making the font size dynamically smaller). In addition, it mainly concerns a number of small improvements and crash fixes. • Clarified certain license activation errors. • The licensing system now uses a FIPS-certified algorithm. • The new-project wizards now contain a step for adding card designs. • Card designs can now quickly be updated via the layouts panel. • Webcam access denied errors now point towards the webcam privacy settings. • Improved search filter validation. • Columns with a default value can now be set to ‘required’ even when they contain empty values. • The BM7 importer can now handle ISO-numeric columns. • After a crash, BadgeMaker Identity will now ask to send a crash report, if metrics are disabled. • The export images window no longer marks fields as invalid before they have been filled in. • Fixed a problem with certain MySQL databases that prevented obtaining table information. • Fixed a local data loading failure caused by incorrect handling of large decimal values. • Fixed that double-clicking anywhere in the open-project window would open the selected project. • Fixed that Thumbs.db files in card design folders could cause saving project configurations to fail. • Fixed that folders open in Explorer could not be deleted. • Fixed a Wiegand-26 incorrect parity-bit encoding problem. • Fixed that unbound CCI fields would cause printing to fail. • Fixed problems with the empty and duplicate value checks in the project settings window. • Fixed a failure to remove the temporary fonts folder after printing. • Fixed a twain capture problem caused by a previous capture process still running. • Fixed date formatting when changing a column type from date to text. • Fixed a font release issue caused by non-ASCII characters in font paths. • Fixed that BadgeMaker did not disconnect gracefully from the Share server when closing. • Fixed a crash when selecting a csv file that was already in use. • Fixed a crash when importing certain BM7 or IDPro7 projects. • Fixed a crash when opening a biometric capture window, caused by certain project configurations. • Fixed a crash when trying to select a biometric image file. • Fixed a crash when trying to crop a biometric image. • Fixed a crash when opening or closing a project, caused by certain project configurations. • Fixed a crash when applying after-encoding triggers failed. • Fixed a crash when trying to open Share projects. • Fixed a crash when trying to add a design, when certain design files are locked by other programs. • Fixed several crashes related to data-loading failures. • Fixed several crashes when saving or loading the project configuration. • Fixed several crashes caused by BadgeMaker Share connection problems. • Fixed several other crashes. • Added fixed-length settings for dynamic fields. • Added a fit-content-to-size option for text fields, which enables dynamic font size downscaling. • The element properties panel now displays the chosen measurement unit. • The preview panel now displays placeholder images for biometric image and barcode elements. • After a crash, BadgeMaker Design will now ask to send a crash report, if metrics are disabled. • Fixed that double-clicking anywhere in the open-design window would open the selected design. • Fixed a crash when copying certain dynamic-logo elements. • Fixed a crash in the open-design window. • Fixed a crash caused by a failure to obtain printer settings. 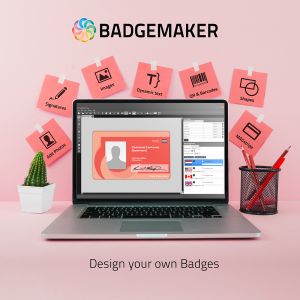 • BadgeMaker Share now detects and handles ungraceful disconnects. • Added support for the Magicard Ultima printer.